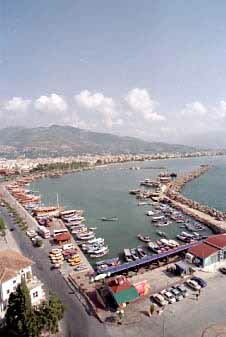 Alanya is originally built on a big rock stretching into sea. 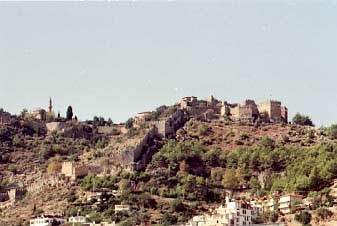 On top a castle is built, and within the walls you can still find houses, shops, a mosque and so on. The best way to see it, is by walking up there. 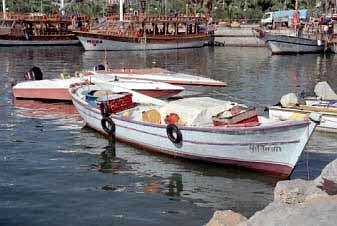 But this takes some effort, so a lot of people go up by bus or taxi, and only walk down. Of course, by doing it the easy way, you won't have the feeling that you really deserved your apple tea. 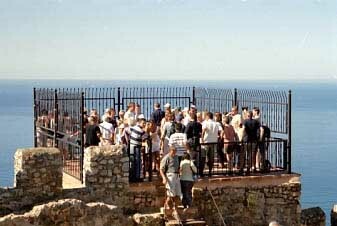 When we finally arrived at the castle (after the apple tea), we discovered there were lots of tourist who reached the castle the easy way. Since there isn't much left of the castle, the only thing to do up here, is just to enjoy the view over the sea. 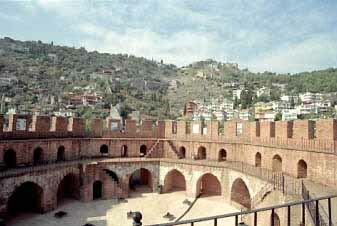 This great view is one of the reasons the castle was never conquered: you could see your enemies coming from very far away. 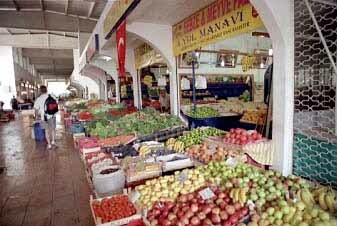 Alanya has, as most Turkish cities, several bazaars where you can buy fruit, vegetables, nuts, spices and so on. 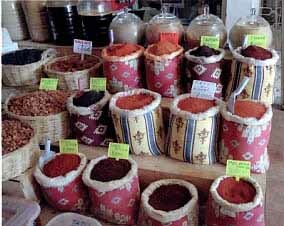 On Fridays at this particular bazaar, there is also a market. The local farmers come to sell there vegetables, and the local people crowd the market to do the shopping for the next week. At the harbour you find the red tower, a part of the castle and connected to it by the walls. There is a museum located in it, which is not too interesting. But the tower itself is worth a visit. 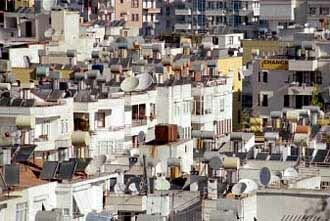 Typical Turkeys roofs: a satellite receiver for the TV and sun collectors and water tanks for warm water. Our hotel (as do most) had a nice swimming pool with a big glide. This offered lots of hours of fun.